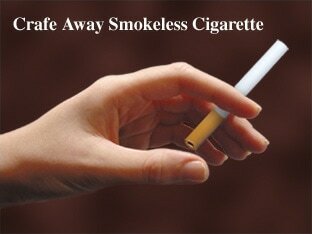 The Crafe Away special cigarette is the simplest aid for smokers who want to give up smoking. The smoker does not light the Crafe Away cigarette. Instead, to enjoy the pleasant tobacco taste the smoker inhales through the Crafe Away cigarette in the same way as a real cigarette. Crafe Away can be used as often as necessary and lasts up to four weeks. Crafe Away has proved successful in many countries all over the world. Crafe Away is sold in department stores, pharmacies, health stores, tobacconists and other retail outlets. There remain many opportunities for importers seeking a novel, simple and successful line that needs no licensing or registration. For orders of sufficient size, packaging can be produced in your own language. For details and prices please contact us.